I was recently approached by Allied Shirts with a promotional offer to custom design a T-shirt and review it. This was a perfect opportunity to design a logo for Not Just Vegetarian. Allied Shirts is a website that offers custom design services for designing T-shirts, sweat shirts, hoodies etc. for a fee. Think T-shirts (or hoodies / sweat shirts) for college, work event, family / college re-union. On Allied Shirts, it was very easy to choose images, font style and size from the options provided. The toughest part was in making up my mind on the Not Just Vegetarian logo. The site gives you options to save your work, and sends a link to your email id, so you can continue to work on it later. The delivery of the T-shirt took about 2 weeks as indicated on the site – can be shorter in my opinion. It’s tough to compare two different versions of your design because the website sends / retains only the images that were last saved. Overall, I am pleased with the ease of designing and ordering a custom design T-shirt on Allied Shirts. Build a Sign and Printcopia (reviewed here on Not Just Vegetarian) are a couple of other brands associated with Allied Shirts. 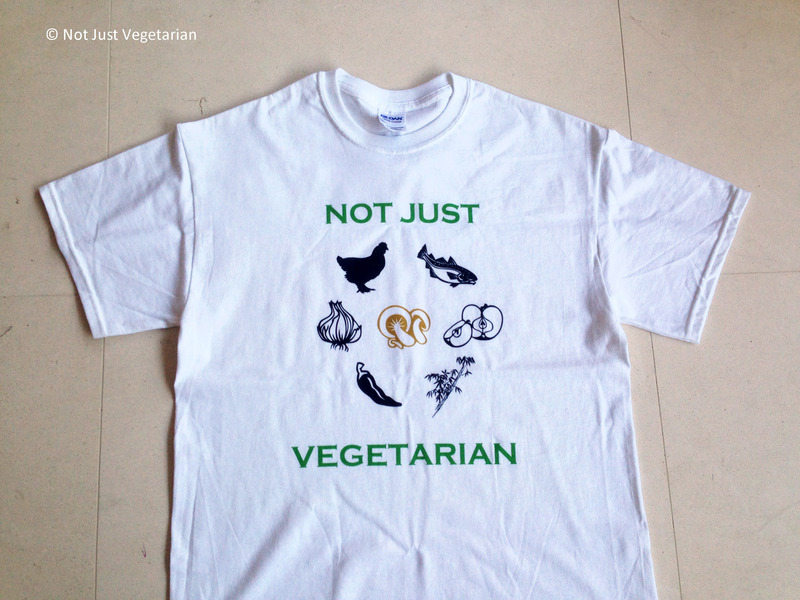 Here is the Not Just Vegetarian logo custom printed on a t-shirt! What do you think of the logo?